New-look Diet Coke’s new commercial doesn’t shy away from the health concerns over the artificially-sweetened soda, part of an expensive new campaign that seeks to inject the struggling soda with a youthful, blunt-talking vibe. 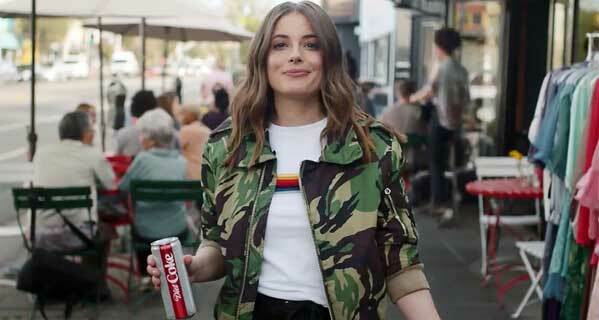 The new commercial features a young woman, the actress Gillian Jacobs (above) who stars in “Love” on Netflix buying a new tall, slim Diet Coke. The campaign, by Anomaly Los Angeles, features a variety of lesser known young actors, rather than major celebrities like Taylor Swift. The phrase “life is short” is usually used in the context of doing something that you know isn’t exactly good for you, but you do it anyway. In another commercial, the Indian-American actor Karan Soni from the movie “Deadpool”, says, “It’s not the kind of cherry you bring home to your mom. It may be too feisty.” Given the slump in sales of soda, the campaign appears to be attempting to strike a rebellious, tongue-in-cheek tone. “We’ve stripped away the glossy marketing and we’re just telling people how good Diet Coke really is,” Danielle Henry, group director of integrated marketing content for Coca-Cola North America, said in a statement. She said a lot of people haven’t tasted it in a while “or ever”. Instead, Witeck says it’s a commercial that emphasises populism and defiance over caution and science. “They’ve turned to a more libertarian message that appeals to a sizeable number of Americans. It seems to say, ‘be healthy or drink a Coke.’ And why not just do what you want? Bottled-water consumption in the US hit 39.3 gallons (149-litres) per capita, while carbonated soft drinks fell to 38.5 gallons (146-litres), the first time that soda was knocked off the top spot, according to recent data from industry tracker Beverage Marketing Corp.
Health concerns related to diet soda abound. Artificially sweetened beverages may be linked to an increased risk of stroke and dementia, according to a recent study by the American Heart Association’s peer-reviewed journal Stroke. The researchers looked at over 4,000 people. Researchers are divided over whether diet soda actually helps people lose weight, according to a 2017 review of trials and studies involving more than 400,000 participants and published in the Canadian Medical Association Journal. Diet soda may actually condition the body to expect calories. Another 2015 study found that older women who consume two or more diet sodas per day are 30% more likely to suffer a cardiovascular event and 50% more likely to die from related diseases than women who rarely consume the drinks. It analyzed nearly 60,000 women aged 50 to 79 years. He also says the commercial is perfect for the Trump era. “Trump voters object to behaving or speaking in politically correct ways,” he says. Some objected to Michelle Obama’s healthy diet and fitness advice for kids, “believing it was a heavy-handed nanny state doctrine,” he adds. “It has a political frame to it, that suggests some consumers including younger Americans, want to be unfettered and free to drink what and when and however they can,” he says. It may also be no coincidence that Jacobs also takes a daring swig from her Diet Coke before actually paying for it.